On the right side of our pages you'll see now a Facebook section dedicated to whippet and sighthound for adoption. Keep your eyes peeled for that special hound in distress! Looking for whippet rescue? Is your hound looking for a mating partner or a play date? Do you have a new litter of whippet puppies? Post your messages here! The Cruft is just around the corner, the hound group will show on Saturday 7 of March at the NEC in Birmingham. The veterinary term for this behavior coprophagia, and you may find some comfort in knowing that this is quite normal. Find out why dogs eat feces and what you can do to stop it. Dogs unfortunately commonly eat their own feces, or another dog's poop; it's a very disturbing and frustrating behavioral problem for pet owners. The veterinary term for this is called coprophagia, and you may find some comfort in knowing that this is quite normal. This article will give you an understanding as to why dogs eat feces, along with what you can do at home to stop it. Feces eating (coprophagia) is common in other animals such as rabbits, rodents, pigs, horses and even primates. This behavior is considered to be a problem in dogs, especially as our dogs now are so close with us, licking our faces. Puppies regularly eat poop. They like to chew and eat anything. The problem is if this becomes an established habit. In some dogs this is secondary to a nutritional deficiency. Some dogs will benefit from a diet change. I suggest first trying a quality premium food. If your pet is already eating one, then switch to one of the natural diets such as Innova or California Natural. You can also utilize some of the sample At Home dog diets, or try feeding some Raw Food. It is believed that a diet rich in fat, protein, and fiber and low in carbohydrates may reduce the tendency. Altering the flavor can help. Your dog will stop eating feces if it tastes bad (although you would think that it already tastes bad). Stool in the back yard or in your cat's litter box can be spiced with Tabasco sauce or cayenne pepper. There are a few things that you can add to your dogs food to alter the taste of their feces. Meat tenderizers can be added to your dog's food; this will help with digestion and make his stool taste horrible. The dose is 1/4 teaspoon per 10 lbs of body weight. Another option is to purchase a product from your local veterinarian called For-Bid. It gives waste a taste that your pet will hate. Many dog owner have found that by supplement the diet, the coprophagia then stops. Add a vitamin and mineral supplement to your pet's diet, as some dogs eat stool who are nutrient deficient. There are a number of types; I prefer complete supplements with vitamins, minerals, probiotics and essential fatty acids. Lastly one study showed that using a citronella spray collar effectively worked for dogs that persisted in eating dog feces. A citronella spray collar reduced the frequency of coprophagia in dogs and that this effect persists after treatment has ceased. This requires you as the pet owner to be watching, and involved, triggering the spray in response to feces eating. If you have a dog or cat that eats their own feces, then you should be looking at some of my advised at home remedies to finally stopping this very undesirable behavior. Start with changing your dog's food to one which is higher in fat, protein, and fiber and low in carbohydrates. Consider supplementing with a complete, quality dog supplement. Then look at adding something to make the feces more adverse tasting, or a citronella spray collar to alter this unwanted behavior. 10) When trying to settle a puppy into a new home, providing them with a warm hot water bottle and placing a ticking clock in the room where they sleep will help to replicate the body heat and heartbeat of their litter mates and can really help them to relax in their new environment. 9) When taking your puppy to the Vet for its first inoculations, health checks etc, it is good practice to sit with your puppy on your lap and not have him or her on the floor. Apart from being able to comfort and re-assure the puppy easier in this position you must also consider the fact that there may be a number of sick animals in the surgery and your puppy is vulnerable if they come into direct contact with infectious animals that may also be in attendance at the same time as your pup. Make a very deliberate effort to ensure your puppy's trips to the vets are as fun as you can make them. Don't allow your puppy to think you are nervous or concerned, instead make a game and even take a toy to amuse the puppy with whilst they sit on your lap. 8) Always ensure from the earliest possible moment that your puppy is given his or her own, private sleeping place that is not used by anyone else in the family or another pet. Your puppy will benefit from short periods left alone in his or her 'den' with you always returning to reward the pup when he or she is relaxed and quiet. 7) Try to make sure your puppy is entertained adequately for short but regular intervals during the day. Long periods of being left unstimulated may lead to destructive or disruptive behaviour later in life. Little games playing 'fetch' with the pup's favourite toy will have the beneficial affect of stimulating the pup, increasing his or her bond with you and allowing the pup to expend short, sharp bursts of energy. 6) Don't over-train your puppy. Remember, a one-year old dog is, effectively, the same as a seven-year old person. It is a good rule of thumb to keep reminding yourself 'would I expect a three, four, five or six-year old child to accomplish some of the tasks I am asking of my pup?' Manners, house-cleanliness and the very basics (including socialisation) are all you should really seek to instil in your puppy until such a time, as they are mature enough to undergo a more formal training regime. Puppies can deceive you into thinking they are ready for training but will ultimately 'rebel' against discipline as they get older. Ensuring you have taught your puppy to respond to his or her name, what is and is not acceptable in terms of house-manners and establishing an uninhibited relationship with your pup is more important than any other discipline in the early stages of any dog's life. 5) OWWWW! Teach your puppy that biting or nipping is not a pleasant experience for you by reacting as if in pain to their playful nips. Rather than scold the dog, let him or her know that nipping is not a pastime that you wish to engage in. Letting out an over-exaggerated expression of pain will more than likely shock the puppy into ceasing this behaviour. You will be glad you put an end to this behaviour early on instead of confronting a 'playful' 2-year-old with a full set of adult teeth! 4) Decide early on what is and is not acceptable in your house. If you don't want your pup to use the living-room sofa as a raised dog bed when they get older then don't encourage him or her to come up for fuss when they're young just because they look sweetly at you and are small enough to pick up. 3) Jumping up. All puppies love to jump out when greeting anyone. Rather than reprimand the pup, simply ignore the behaviour and wait until he or she settles down and is not jumping up before lavishing any attention on them. Above all else, don't encourage the behaviour by patting or praising the dog when they are in the 'jump-position' or you may run in to problems as the dog gets bigger and views jumping up as an easy way to receive attention. 2) The puppy's name will be with them for life, make sure they know it by associating it with all things pleasant and fun. In the same way dog's cotton on in a very positive way to words such as 'walkies', 'biscuits' or 'dinner-time' they should be given the same association with their own name. Too often the only time the puppy hears his or her name is when they have done something naughty. 'Jasper, stop doing that!' 'Buster, leave that alone!' It's tough but try to ensure that you NEVER use the puppy's name in a negative scenario only positive ones. Instead of 'Jasper, leave that alone!' simply, 'Leave that alone!' or better yet 'No!'. And instead of 'walkies', biscuits or 'dinner-time' try 'Jasper, biscuits! ', 'Jasper, walkies! ', 'Jasper, dinner-time!' Golden rule. Your puppy should associate his or her own name with all that is pleasant and fun and nothing that is negative. The word 'no' is negative and it is enough to cover all undesirable behaviour. 1) From the moment your puppy comes into your life teach him that coming to you when called is nothing short of being the best thing in the world. Puppies can't resist humans who sit down on the floor with legs spread apart so, while they're easily persuaded to come by this very simple gesture, make the most of it by using their name, sparingly, but making a huge fuss when puppy arrives. Try it at times when pup is pre-occupied with something interesting and make coming back to you the most enjoyable and rewarding experience in the world for him or her. You will really see the benefits as the dog gets older. All content � K9 Media Solutions Ltd & K9 Magazine. 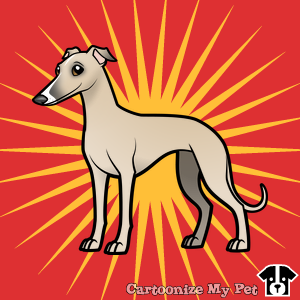 Would you like to easily create a digital image of your whippet and print it on shirts, mugs, pillows? Have fun with Cartoonize My Pet!